Wouldn’t it be amazing if there was a free Pinterest scheduler that you could use to schedule your Pins weeks or even months in advance? What if I told you that there is and you can?! Pinterest automation sends a huge source of traffic to websites like blogs and eCommerce stores. It is an important business tool that we can’t ignore. Try Tailwind for FREE. I’ve been using Tailwind to schedule my Pinterest pins for more than a year now and it truly skyrockets your blog traffic! If you’re struggling to get pageviews like I was, then Tailwind is your answer. But there is one tiny catch when using Pinterest for major traffic – it can take hours of your valuable time every week to Pin consistently! With my free pinning method, you can avoid the monthly cost that comes with paid schedulers like Tailwind and Buffer. These tools are certainly worth the cost to many bloggers, but free is always worth considering! Keep in mind that if you’re looking for a scheduler that will save you tons of time, then Tailwind is your answer. I have used both Tailwind and the method I’m about to teach, and I fully realize that time is money. As you walk through the steps to setup your pinning schedule for free, please also sign up for Tailwind’s free trial and test them out as well. It’s not fair to say that one is better than the other until you’ve tried them both! In this tutorial I am going to tell you exactly how you can schedule your Pins using this free Pinterest scheduler! Unlimited Pins, no trial periods, and no games! Not interested in the extra work of setting up a free Pinterest scheduler? Ease your Pinning efforts and try Tailwind for free! 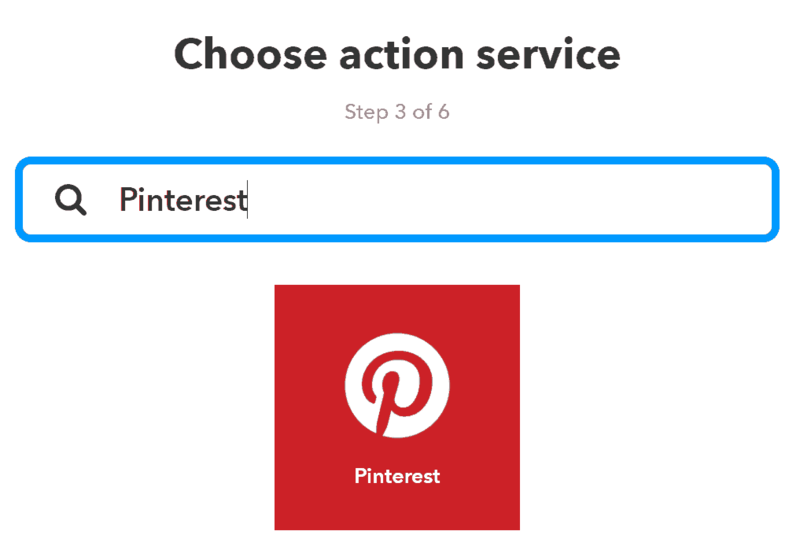 What Pinterest Actions Can You Automate with IFTTT? I recently discovered an amazing (and free) automation tool called IFTTT and I am going to tell you exactly how to set it up below! Click here to skip to the steps. After Crystal, over at Mommy is a Wino, walked me through some automation steps to schedule Twitter and Facebook posts, I had to see what else I could do with IFTTT. So I set out to test it as a free Pinterest scheduler! And for those who are concerned of the “legality” of using IFTTT to schedule Pins, IFTTT is Pinterest API approved as of May 6, 2015. In other words, like other paid schedulers such as Tailwind and Buffer, using IFTTT as a free Pinterest scheduler is perfectly safe and approved by Pinterest. I’m going to share a few of the more common Pinterest automation recipes that you can create using IFTTT. But stick with me, because it’s the uncommon and unknown recipes that you can use to schedule Pinterest posts. You can quickly automate your Instagram images to Pin to a specified board of yours on Pinterest when you use a specific hashtag. Create your recipe on IFTTT and specify the hashtag and board that you would like some of your Instagrams to post to. 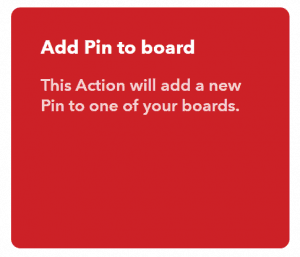 You can trigger all Pins shared to any specified board(s) to be shared on Twitter. This helps streamline your actions across social media and saves time with Pinterest automation. As soon as you publish a post on WordPress, you might be overwhelmed with the after-publishing steps that need to be done. With this Pitnerest automation tool, you can have your new posts automatically Pin to a specified board on Pinterest. And now on to the reason you are here. We are all dying to learn about the Pinterest Pin scheduler that is free, because Pinning consistently is hard. So this is why I’m going to share exactly how you can use this Pinterest Pin scheduler. It is extremely easy to schedule Pins using IFTTT as a Pinterest scheduling tool but there are a few things you should know if you go with the very basic method I am about to teach. If you do need all the bells and whistles of a paid Pinterest scheduler, then Tailwind has you covered. However if you’re a new blogger or just frugal like I am, then continue reading and learn about this free Pinterest scheduler that I’m about to teach you how to setup. Try Tailwind for FREE for a month and compare methods! Scheduling Pins using IFTTT can take just as long as it takes to Pin manually throughout the week. The benefit of this free Pin scheduler is that you can batch your Pinning efforts and get it done for the week ahead in one sitting. Scheduling Pins using IFTTT as a Pinterest scheduler is still a manual process and requires you to curate your 3rd party content and write (or copy/paste) your descriptions. You do not want to schedule too far in advance because adding your newest blog posts into the schedule would then be difficult. I like to Pin my newest posts manually and then add them into the next scheduled batch. Let’s jump right into the steps and learn how to use this free Pinterest scheduling tool! IFTTT is the amazing tool that will help us create a Pin schedule! Sign up here, it’s free. 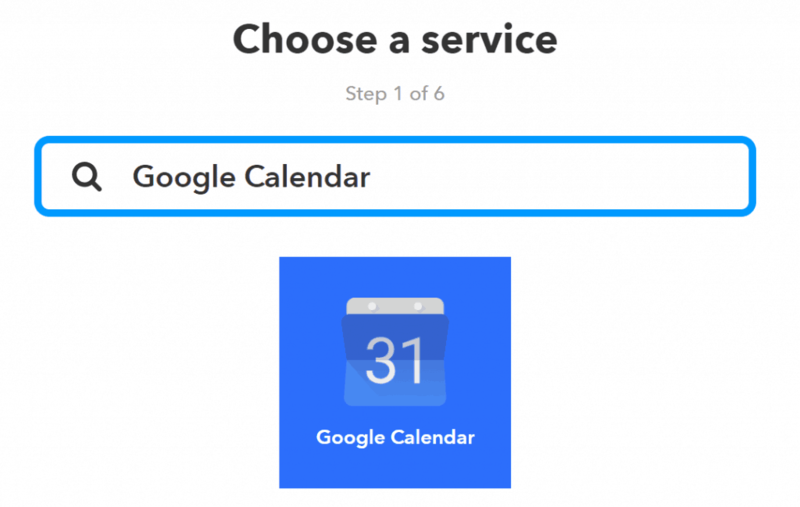 You will need a Google account (Gmail) to schedule your Pins for free using IFTTT. If you are not already on Gmail, it’s free to signup. There are some amazing tools that Google allows us to use for free – be sure to take advantage of them! Sign up here. Using your Google account you’ll need to create a new Google calendar specifically for your scheduled Pins. Let’s call this new calendar “Pin Queue” since we will be using it to schedule out our Pins to be posted to Pinterest automatically at a later date. On IFTTT, visit “My Applets” and select “New Applet” to get started creating your first recipe. 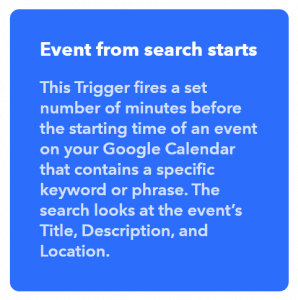 Select the blue plus sign next to “this” to set up the trigger between your Google calendar (the tool that we’ll use to schedule our Pins) and your Pinterest account. Type “Google Calendar” into the search bar and select the blue calendar icon. 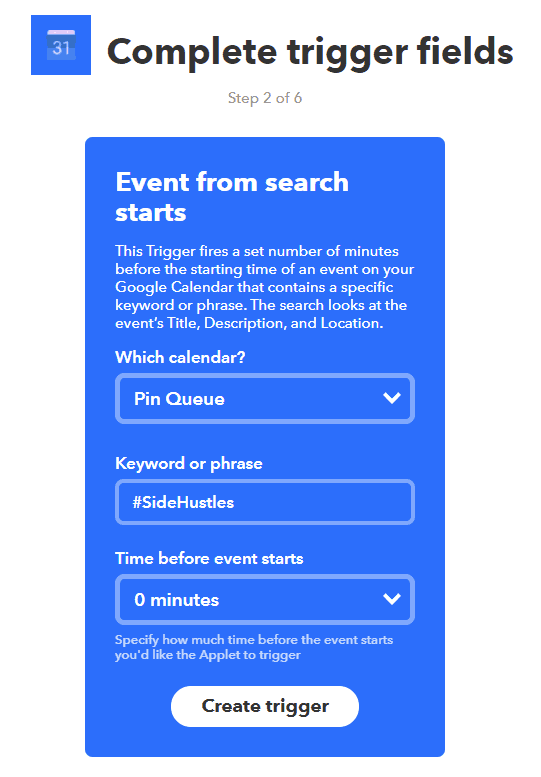 Select the option titled, “Event from search starts.” This option allows you to assign each scheduled Pin a hashtag that sends it to a specific board. 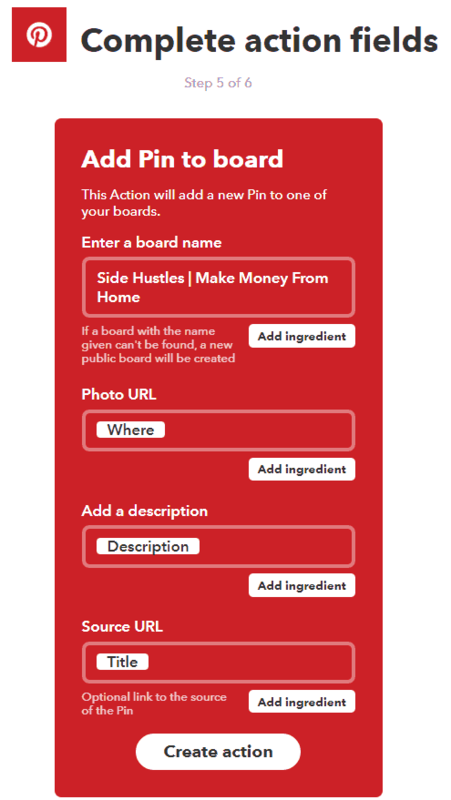 For example, all Pins that I hashtag #SideHustles will go to my Side Hustle board on Pinterest. Next you’ll choose your newly created calendar called “Pin Queue” and add the hashtag for your first board. Make sure your hashtag matches the board you would like to schedule this first category of Pins to. This hashtag will be visible on each Pin that you schedule to this board, so you want to make sure it’s generic and fitting. Other examples I use: #workfromhome (Pins to my board all about making money / working from home), #homebusiness (home business tips board), #pintereststrategies (for my Pinterest tips board), etc. Leave your “Time before event starts” at 0 as this will trigger your Pins at the time you schedule them on your Google calendar. Next, select the blue plus sign next to “that.” This will allow us to create the automatic posting action on Pinterest. Type “Pinterest” into the search bar and select the Pinterest icon. Select “Add Pin to board” to set the board parameters. Your trigger is now set! When you schedule a Pin on your calendar (we’ll walk through this next) with the hashtag #SideHustles in the description, the Pin will automatically save to your Side Hustles board on Pinterest! You’ll need to walk through step four for each one of your boards and assign a unique hashtag to each trigger. Keep in mind you can either create a separate Google calendar for each board, or you can place all Pins on the same calendar. I have tested both and ultimately I will be streamlining my scheduling by keeping all Pins to my boards on one calendar. I will have a separate calendar to schedule Pins to all of my group boards. The reason for creating two separate calendars for my boards and for group boards is because I will be looping my Pins to group boards. If you do loop Pins, just be careful to review group board rules because some boards do not allow repeats whereas others allow repeats after a certain period of time. I am still thinking about looping some great 3rd party Pins to my own boards so that a year down the road, for example, I have less and less manual scheduling of 3rd party Pins to do. This is completely up to you. To schedule a Pin to your newly created “Pin Queue” calendar, visit your Google Calendar. Select the date you would like to schedule your very first Pin. Let’s create a test Pin right now! First, locate a nice Pin on Pinterest that will fit well on your “Side Hustles” board (or the board you chose for your first recipe). We’ll use this Pin as an example. 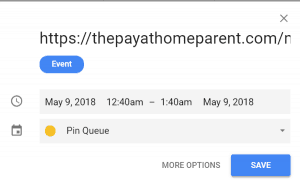 You will need to open the article that the Pin links to in order to gather the necessary information to add this Pin to your schedule. 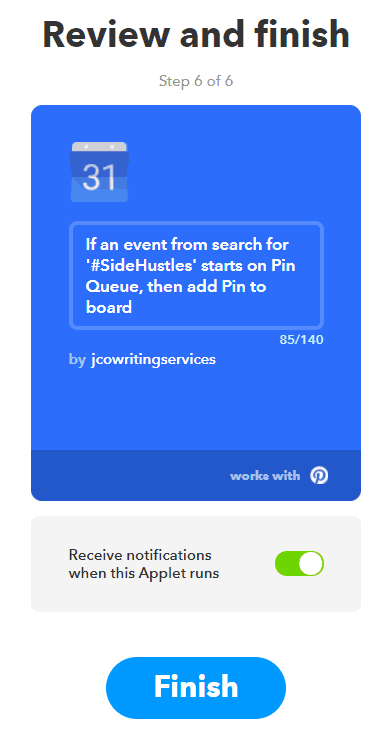 Write a new description or copy/paste the description already posted on the Pin you chose to schedule. You must include the proper hashtag in your description so that this Pin saves to the assigned board. Otherwise the IFTTT Applet will fail / skip this entry. I included the hashtag #SideHustles so that this Pin would go to my Pinterest board that is all about side hustles. In the blog post you are pinning, locate the Pin image and copy the image URL. You can usually do this by right-clicking the long image and selecting “Copy image address.” Paste the image URL in the “Add Location” section of your Google calendar event. Head to your Pinterest profile and view your latest Pin to verify that it is the Pin you just scheduled. Then make sure that it posted your test Pin to the correct board, with the correct image, blog post URL and description! If you’ve followed the instructions to a T then you will find that it works! Make sure to allow 10 to 15 minutes to pass since you scheduled your Pin to save 10 minutes ahead. So now you know how to use this amazing, free Pinterest scheduler! After you create all of your Google calendars and IFTTT recipes (a one time task), you will simply need to schedule Pins on your calendar. There is some limitation on the speed of using this method because you will need to track your time and dates for your Pins and schedule them one by one. You will want to make sure you are spacing your Pins throughout the day and week to take full advantage of this free Pinterest scheduler. We’re in a century of automation. Embrace it and enjoy it! My email subscribers will be the first to know when my upgrade Pinterest scheduler is available, so please feel free to join my list! I love talking about all things Pinterest, blogging and home business. If you have taken the time to set up your first Applet on IFTTT, please let me know in the comments! I would love to celebrate with you as you put this free Pinterest scheduler to use. I am the first to admit that I did a little “happy dance” when I tested this method and found that it works! Please reach out to me if you have any questions about this free Pinterest scheduler! If you’re not sure which avenue to take when it comes to creating a Pinning schedule, try Tailwind for free and compare values! You are so welcome! Thank you for the kind words :). YES, you can actually loop pins using this scheduling method if you want to – which is perfect so that you don’t have to do the same thing over and over. I’m so excited that this will help you! The URL defaults to Pinterest.com and you have to click through that to get at a post with your own URL. Is there a way around this problem? Thank you! I learned about IFTTT for Facebook from a friend and then dug in because I knew there must be SOME way to make it work for Pinterest too! This looks great. If I use an existing pin and put its Url, does this enable you to loop existing pins? No, I don’t think so. You will need to use the URL to a post (not to an existing pin). Once you create an event can essentially loop it out on your calendar as many times as you’d like! Hey! Thanks for this! I am just starting out with Pinterest and was investigating Tailwind. With the help of your blogpost and a zap (Zapier) between Google sheets and google Calendar, I have created a sheet where I can schedule everything in rows and it automatically schedules everything, so amazing! One thing left to figure out is how to set up reoccurring events via Zapier, then I´m completely happy! 😀 Thank you! Actually, I can have a set interval of reoccurring pins but then ALL would be scheduled at that interval, is there anything that would stop me from doing that? I mean, if I pin something I might aswell have it pin every 3 months right? Can that hurt me in any way? I’m so happy you figured this out! it’s a lot of work to get it set up, but it’s worth it. A three-month interval between duplicate pins is plenty! Just make sure to keep filling out your schedule with new pins in the meantime so that it’s not literally the same pins in the exact same pattern forever (though if it’s spread out, it may not matter!?). With your guidance it was easy! So brilliant! I will fill out the schedule and after some time it will be completely full! So awesome!!! This is amazing. Now I am trying to design my own scheduler for Pins. Can you tell me how you guys figured out to pin in a section of a board. Right now I am able to do it in a board but if I give “/” to identify section ( ex: Board1/Section2 ) it creates a new board called “Board1/Section2”. Any thoughts ? I don’t think there is a scheduler yet that can pin to a section, unfortunately! I didn’t work out a way to do it with IFTTT. Hopefully you can find a workaround!